The three coffins were placed in a rectangular quartzite sarcophagus with a red granite lid. 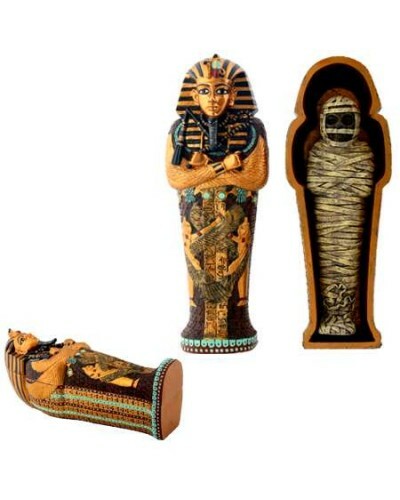 This reproduction represents the middle coffin. This original coffin is constructed of wood overlaid with thick gold foil. 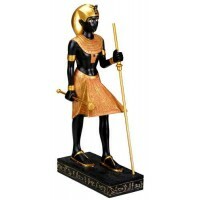 The original coffin is shaped as a mummiform Osiris figure, arms crossed on the chest holding the sacred insignias, the crook and the flail. The royal symbols, uraeus and vulture, are attached to the striped nemes headdress and under the chin, on the original, the divine beard is inlaid with blue glass imitating lapis lazuli. The breast is covered with a wide collar richly adorned with precious stones on the original. On the wrists, wide bracelets are inlaid with jewels on the original. The two protective goddesses of Upper and Lower Egypt, Nekhbet the vulture and Wadjet the Cobra with bird's body, embrace the King's torso. The entire surface of the body was decorated in a feathered pattern. On the original, the feathers are each inlaid with jasper-red, lapis-blue and turquoise glass. 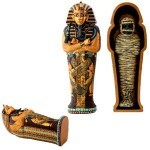 This cold cast resin version of the famous coffin is 6 3/4 inches long with amazing hand painted detail. The top of the box lifts to reveal the removeable mummy of King Tut. Item Number: YT-8389 | Approximate Size (Inches): 6.75 wide x 2.50 deep x 2.75 high | Approximate Shipping Weight: 2.50 lbs.